The motto of proposed web solution is to provide online purchasing of new mobile screens that will be offered by administrator and sending broken screens for refurbishing or selling over to admin that would be a User Centric, User Oriented and would be easy to navigate and use. The objective of the proposed web solution is to develop effective services. Wefurb has chosen us for our ability to develop complex websites and providing efficient solutions with logical approach to the requirements. The website has only single version that is running successfully from the date it was released. “ECOMMERCE WEBSITE” for refurbishing mobile screen business that will provide users to purchase mobile screens over site. Users will be able to register and login over website. They will be able to search mobile screens by entering the keyword or by categories defined over the website. User will be able to view list of screens for purchasing over the website from which they can select the respective screen to view its details over the website like screen title, description, images and refurbish, sell & buy prices on the respective pages. User will be able to place order and make payment using payment gateway integrated over the website.Through the site users will also be able to send their screens (minimum 50 screens) for refurbishing manually via shipping. They will be able to view per screen price according to their screen quantity for refurbishing / selling screen over website. They will be able to view respective cost over site according to their quantity of screens they send to admin manually & can make online payment accordingly over site. 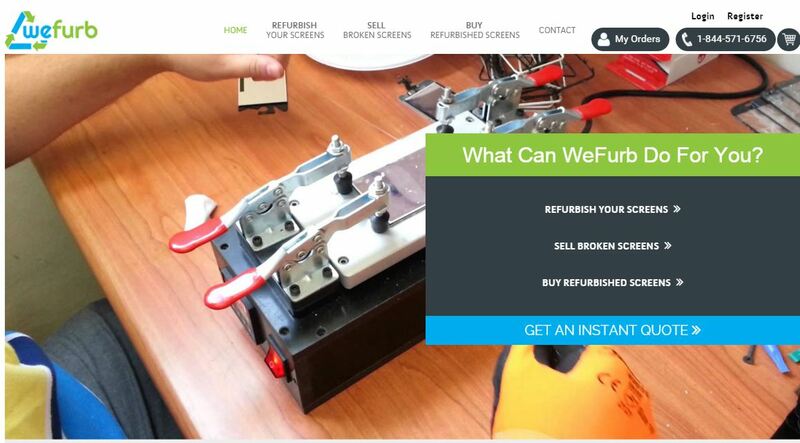 They will also be able to sell their broken screens to the admin and can receive credits over website. We continue to provide expertise and services in support of WeFurb ongoing program of website development.